Northampton station will be hosting a special choral celebration later this week, as part of this year’s BBC Music Day. Northampton Male Voice Choir will be performing at the station as part of the nationwide ‘Platform to Perform' themed spectacle. On Friday 28 September, 40 railway stations across the country will be taking part by hosting local choirs throughout the day. The local collective of 85 singers have performed in a range of venues and have been instrumental in raising money for local charities. The choir wear the Northampton Coat of Arms badge, which was awarded to the group in 1980 for their fund-raising contributions. London Northwestern Railway will also be hosting a ‘Platform to Perform’ concert at Milton Keynes station, where female a capella group, Junction 14, will be performing. The initiative is part of this year’s BBC Music Day. The annual event celebrates music of all genres and looks to find new and innovative ways of bringing communities together. Northampton Male Voice Choir will be performing on the concourse at Northampton station on Friday 28 September between 0800 and 0900. The group will be singing a 45 minute set to entertain commuters and anyone who would like to attend the free performance. Northampton Male Voice Choir was formed in 1946 and was originally known as the ‘Northampton Men’s Own Male Voice Choir’. The group’s name was changed in 1980 when they were awarded the Northampton Coat of Arms badge, in recognition of their fund-raising efforts for local charities. The group enjoy singing to large audiences, frequently in the surroundings of magnificent buildings and on occasions, alongside other choirs. 2018 has been a very exciting year for the choir. A highly successful recruitment campaign has increase numbers to 85 choristers making NMVC one of the largest male voice choirs in the country. 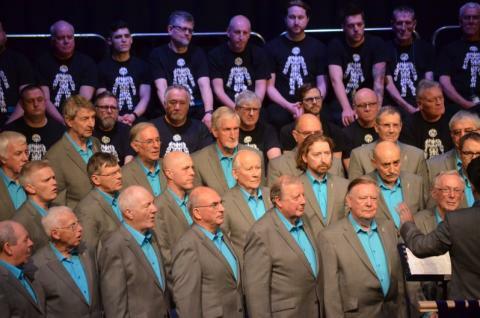 Associated with the campaign the choir held a concert that raised £15000 for Prostate Cancer UK, continuing the Choir’s commitment to raising money for charity. Northampton station will be hosting a special choral celebration later this week, as part of this year’s BBC Music Day. Northampton Male Voice Choir will be performing at the station as part of the nationwide ‘Platform to Perform' themed spectacle.